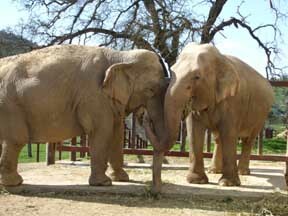 When Gypsy moved to the Asian barn, she gravitated to Wanda immediately, almost like they were old friends, rumbling, spinning, urinating, defecating and trumpeting. Wanda responded with her sea lion croak, rumbling, spinning and touching Gypsy on the head, trunk, legs, any part of Gypsy’s body that she could reach through the fence posts. They slept standing as closely as possible, and refused to move except in tandem. 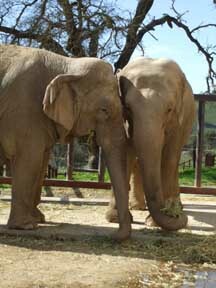 When Gypsy made her first trips out to the habitat, she stayed close to Wanda, and now they are almost inseparable. 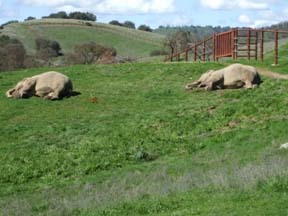 They move out to the habitat together, and Gypsy is the sentinel when Wanda sleeps, standing nearby and grazing on the new, spring grass; then softly rolling down beside Wanda in the warm sun. 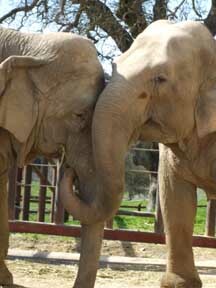 Their behavior is like some of the bonded pairs who have lived at PAWS, not like two elephants who have met for the first time. Last week we were reviewing old video, which was taken of various circuses 20 years ago, searching for footage of Ruby when she performed in the circus. What we found was astonishing — Nicholas’ father, Tunga, Gypsy, Gypsy’s calf (Brat, now deceased), and Wanda. We did not find Ruby, but her calf, Diamond (now deceased), was also in the footage. I remember when we started filming circuses in 1985 how we hated seeing the elephants standing, rocking and swaying, chained next to each other, unable to move. As we filmed, we often went home thinking how wonderful it would be to free those elephants. It is immensely gratifying to know that we succeeded for Wanda, Gypsy, Ruby, Nicholas, Rebecca and Minnie. Sadly, circus elephants have little solace in their lives except for the comfort of other elephants, and they never forget old friends, even over more than 20 years. This year, our 25th year of fighting to free elephants from circuses, is very special for us and for Gypsy and Wanda — best friends forever. To see video Gypsy and Wanda in the circus and now Click Here.